Luis Armando Avilán attended Barquisimeto school in Lara, Venezuela...Enjoys going to the beach and spending time with his family when he's not playing baseball... His favorite musical artist is Eminem. Appeared in 70 games, the third time in his career he reached that threshold...Earned the first two saves of his major league career, August 2 vs. Kansas City and August 15 at Detroit...Fanned 51 batters, marking his second-straight 50-strikeout season (had no such seasons prior to 2017)...Allowed nine of 48 (18.7 percent) of inherited runners to score, the ninth-lowest rate in the majors (min. 30 inherited runners)...Held lefties to a .220 (18-82) average and a .646 OPS...Before being traded to Philadelphia, was tied for seventh in the AL in appearances (58 through August 21). Appeared in 61 games with the Dodgers … allowed just 18.2 percent (4-22) of inherited runners to score … limited first batters to a .196 (11-61) average and lefties to a .195 (16-82) mark...Struck out a career-high 52 and surrendered two or fewer home runs for the fifth time in his career … his 13 holds were the third-most of his career, and marked his third season with double-digits (also 2013, '15)...Lowered his ERA from 4.30 (11 ER/23.0 IP) in the first half to 1.57 (4 ER/23.0 IP) after the break...Pitched on zero days rest 17 times, allowing 10 hits with eight strikeouts over 12.0 scoreless IP...Each of his first eight appearances (5.1 IP) and 17 of his first 18 overall from 4/4-5/14 were scoreless...Recorded a 14-game scoreless streak from 7/8-8/21, allowing just six hits with 14 strikeouts and five holds over 12.1 IP. Was not on the Dodgers postseason roster. Shuttled back and forth between the Dodgers and Triple-A Oklahoma City, logging seven different stints with Los Angeles ...went 3-0 with a 3.20 ERA and limited opposing hitters to a .176 batting average with 28 strikeouts in 19.2 innings over 27 appearances with the Dodgers...Stranded 19 of 26 inherited runners...Made five scoreless appearances for the Dodgers in the postseason (3.2 IP)...With OKC, posted a 0-3 record with a 4.24 ERA in 33 games. Made 62 appearances (43.1 innings pitched) out of the bullpen while going 4-1 with a 4.57 ERA in his third Major League season...Was optioned to Triple-A Gwinnett on 7/19; Made nine appearances out of the bullpen before being recalled by Atlanta on 8/14. Had a 5.40 ERA over 11.2 innings for GWI. Allowed eight runs (seven earned) on 13 hits while issuing 11 walks...Allowed 22.9% (11-of-48) of his inherited runners to score, which ranked as the 14th-best mark in the National League...Suffered his first career loss on 4/10 vs. NYM. According to the Elias Sports Bureau, his 110 appearances without a loss to start his career was the fifth-longest such streak in Major League history (since 1900)...ERA by month: April (7.36), May (2.53), June (3.86), July (11.57), August (3.00), September (4.22)...Twice allowed four or more earned runs, 4/14 at PHI (5 ER/1.0 IP) and 9/25 vs. PIT (4 ER/ 1.1 IP). Without those two appearances, his ERA for the season was 2.85 (13 ER/41.0 IP). His ERA between those two outings, 4/18-9/21, was 3.00 (12 ER/36.1 IP)...Despite allowing a career-high five runs (all earned and with a 5-1 lead) on four hits in the eighth inning on 4/14 at PHI, picked up his third win of the season after the Braves scored four runs in the ninth on Dan Uggla's grand slam...Pitched at a 0.73 ERA (1 ER/12.1 IP) from 4/18 to 5/26...Entered 5/4 vs. SF with bases loaded and one out, needed one pitch to induce a double play to strand all three inherited runners...Worked a season-high 2.0 IP on two occasions: 9/9 at WSH and 9/28 at PHI...Made 10 relief appearances totaling 7.0 innings, going 0-0 with a 3.86 ERA with Cardenales de Lara of the Venezuelan Winter League. Produced a fine sophomore season, going 5-0 with a 1.52 ERA in 75 appearances out of the bullpen. Held opponents to a .175 batting average and allowed just 40 hits over 65.0 innings pitched. His 1.52 ERA ranked seventh among Major League relievers and third among National League relievers. Among National League relievers, his .175 opponents' batting average ranked sixth, while his 27 holds were tied for third, his 75 appearances ranked tied for fourth and his five wins were tied for 13th. Posted a streak of 35 consecutive appearances (from 5/24 to 8/14) without allowing an earned run. The streak was the second-longest single-season stretch in MLB history to ATL's Craig Kimbrel, who had 38 such appearances in 2011. 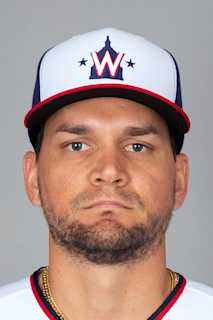 During the span, Avilan allowed just 22 baserunners (11 hits, nine BB and two HBP) over 31.2 innings pitched, while posting a .106 opponents' batting average. Made his first career appearance in the postseason, appearing in all four of the Braves' National League Division Series games vs. LAD. Posted 2.2 scoreless frames while allowing three hits. Induced a 1-6-3 double play in the seventh inning of Game 2 to preserve a 2-1 lead. According to the Elias Sports Bureau, he was just the second pitcher in MLB postseason history with an inning-ending 1-6-3 double play with the tying run on third base, joining CLE's Bob Lemon (Game 6 of the 1948 World Series vs. the Boston Braves). Over his final 54 games of the season, from 5/24 on, owned a 0.95 ERA (47.1 IP/5 ER) while holding opposing hitters to a .154 average. His ERA vs. National League teams was 0.79 (56.2 IP/5 ER) in 65 appearances, compared to 6.48 (8.1 IP/6 ER) vs. teams from the American League (10 appearances). Held opposing left-handed hitters to a .144 (15-for-104) batting average, compared to a .202 (25-for-124) average by opposing right-handed hitters. Completed 1.1 innings or more on 11 different occasions. Each of those 11 outings were scoreless, while he allowed just nine hits and logged 11 strikeouts over 18.0 total innings. Suffered a left hamstring strain and cramping on 4/16; missed just four team games with the injury. Earned the win in relief on opening night (4/1) vs. PHI, stranding two IR and logging 1.2 scoreless IP. Spent first full season at Double-A Mississippi going 4-8 with a 4.57 ERA in 36 games (13 starts)...Started final 11 games of the season and 13 of his final 17 appearances...Went 1-4-1 with a 5.92 in 23 outings out of the bullpen and 3-4 with a 3.82 ERA in 13 starts...Three times posted back-to-back scoreless outings, 4/11 & 4/15 and 5/17 & 5/20 and 5/27 & 5/30...Went 4-2 with a 2.47 ERA in 19 games (five GS) for the Cardenales de Lara of the Venezuelan Winter League...Had his contract purchased and he was added to the Braves 40-man roster on 11/16/11. Went a combined 6-4 with a 3.54 ERA (27 ER/68.2 IP) in 41 appearances between Rome (A) andMyrtle Beach (High-A)...Converted nine of 12 save opportunities for Myrtle Beach. Recorded two saves in 11 relief appearances with Danville (R). Honored as the Gulf Coast League Braves August Pitcher of the Month (2.93 ERA, 3 GS) by theBraves organization...Posted back-to-back scoreless outings 7/15 (relief appearance) and 7/19 (start) to earnAppalachian League Pitcher of the Week, week ending 7/20. Held opponents to the third-lowest (tied) batting average in the Braves farm system with a .213 markand ranked fourth among starters with a 2.44 ERA and a 1.00 WHIP. March 28, 2019 New York Mets selected the contract of LHP Luis Avilan from Syracuse Mets. January 10, 2019 New York Mets signed free agent LHP Luis Avilan to a minor league contract and invited him to spring training. January 10, 2019 LHP Luis Avilan assigned to Syracuse Mets. November 30, 2018 LHP Luis Avilan elected free agency. August 23, 2018 Philadelphia Phillies activated LHP Luis Avilan. August 22, 2018 Chicago White Sox traded LHP Luis Avilan to Philadelphia Phillies for RHP Felix Paulino. January 4, 2018 Chicago White Sox Traded 2B Jake Peter to Los Angeles Dodgers; Los Angeles Dodgers Traded cash, RHP Joakim Soria and LHP Luis Avilan to Chicago White Sox; Los Angeles Dodgers Traded SS Erick Mejia and RHP Trevor Oaks to Kansas City Royals and Kansas City Royals Traded RHP Joakim Soria and LHP Scott Alexander to Los Angeles Dodgers. November 2, 2017 Los Angeles Dodgers activated LHP Luis Avilan. October 6, 2017 Los Angeles Dodgers reassigned LHP Luis Avilan to the minor leagues. August 11, 2017 Los Angeles Dodgers activated LHP Luis Avilan from the paternity list. August 8, 2017 Los Angeles Dodgers placed LHP Luis Avilan on the paternity list. June 9, 2017 Los Angeles Dodgers activated LHP Luis Avilan from the 10-day disabled list. June 4, 2017 Los Angeles Dodgers sent LHP Luis Avilan on a rehab assignment to Oklahoma City Dodgers. May 25, 2017 Los Angeles Dodgers placed LHP Luis Avilan on the 10-day disabled list retroactive to May 24, 2017. Left triceps soreness. December 7, 2016 LHP Luis Avilan assigned to Cardenales de Lara. September 5, 2016 Los Angeles Dodgers recalled LHP Luis Avilan from Oklahoma City Dodgers. September 3, 2016 Los Angeles Dodgers optioned LHP Luis Avilan to Oklahoma City Dodgers. September 2, 2016 Los Angeles Dodgers recalled Luis Avilan from Oklahoma City Dodgers. September 1, 2016 Los Angeles Dodgers optioned LHP Luis Avilan to Oklahoma City Dodgers. August 31, 2016 Los Angeles Dodgers recalled Luis Avilan from Oklahoma City Dodgers. August 25, 2016 Los Angeles Dodgers optioned LHP Luis Avilan to Oklahoma City Dodgers. August 23, 2016 Los Angeles Dodgers recalled Luis Avilan from Oklahoma City Dodgers. August 11, 2016 Los Angeles Dodgers optioned LHP Luis Avilan to Oklahoma City Dodgers. July 19, 2016 Los Angeles Dodgers recalled Luis Avilan from Oklahoma City Dodgers. July 8, 2016 Los Angeles Dodgers optioned LHP Luis Avilan to Oklahoma City Dodgers. July 7, 2016 Los Angeles Dodgers designated Luis Avilan for assignment. July 5, 2016 Los Angeles Dodgers recalled LHP Luis Avilan from Oklahoma City Dodgers. May 26, 2016 Los Angeles Dodgers optioned LHP Luis Avilan to Oklahoma City Dodgers. May 23, 2016 Los Angeles Dodgers recalled Luis Avilan from Oklahoma City Dodgers. April 25, 2016 Los Angeles Dodgers optioned LHP Luis Avilan to Oklahoma City Dodgers. April 21, 2016 Los Angeles Dodgers recalled Luis Avilan from Oklahoma City Dodgers. April 2, 2016 Los Angeles Dodgers optioned LHP Luis Avilan to Oklahoma City Dodgers. July 31, 2015 Luis Avilan roster status changed by Los Angeles Dodgers. January 3, 2015 LHP Luis Avilan assigned to Tigres de Aragua from Cardenales de Lara. November 29, 2014 LHP Luis Avilan assigned to Cardenales de Lara. August 14, 2014 Atlanta Braves recalled LHP Luis Avilan from Gwinnett Braves. July 19, 2014 Atlanta Braves optioned LHP Luis Avilan to Gwinnett Braves. July 5, 2012 Atlanta Braves recalled Luis Avilan from Gwinnett Braves. July 4, 2012 Luis Avilan assigned to Gwinnett Braves from Mississippi Braves. May 11, 2012 Luis Avilan roster status changed by Mississippi Braves. April 21, 2012 Mississippi Braves placed LHP Luis Avilan on the 7-day disabled list. April 2, 2012 LHP Luis Avilan assigned to Mississippi Braves from Gwinnett Braves. March 19, 2012 Atlanta Braves optioned Luis Avilan to Gwinnett Braves. November 16, 2011 Atlanta Braves selected the contract of Luis Avilan from Mississippi Braves. April 6, 2011 Luis Avilan assigned to Mississippi Braves from Lynchburg Hillcats. March 21, 2011 LHP Luis Avilan assigned to Atlanta Braves. May 20, 2010 LHP Luis Avilan assigned to Myrtle Beach Pelicans from Rome Braves. April 3, 2010 Luis Avilan assigned to Rome Braves from Danville Braves. October 9, 2009 LHP Luis Avilan assigned to Cardenales de Lara. June 22, 2009 Luis Avilan assigned to Danville Braves from GCL Braves.